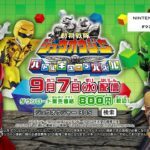 Super Sentai’s annual video game’s just been announced as Dobutsu Sentai Zyuohger: Battle Cube Puzzle for Japanese region Nintendo 3DS consoles! Rather than having it be a beat’em up like past games, Battle Cube Puzzle as the name suggests will be a puzzle game with a turn based RPG mechanic and the main six Zyuohgers being playable. Mech battles will play a part of the game, though it seems like the mechanics for that remained unchanged from previous titles. Other features include story mode, survival mode, puzzle mode, and of course: 5 player multiplayer. Battle Cube Puzzle will be released September 7th for 800 yen.